Your Best Tan Starts with Prep! A 100% Streak-Free Finish - The Perfect Tan for Beginners! Try Skinny Tan Coconut Water Tanning Mist! The key to a great tan? Prep and maintenance. Thanks to Skinny Tan's gorgeous collection of products to prep and maintain your tan, patchy tans and uneven fade is now a thing of the past. From the Skinny Tan Primer that works to remove dry and dead skin cells with ease before your tan, to the fan-favourite Dual Sided Luxury Tanning Mitt with a double-sided velvet finish for smooth and fast tanning application while protecting palms; Skinny Tan's collection contains products to ensure preparation and application are smooth and seamless. The maintain range is just as gorgeous with the luxurious After Glow Gloss, a moisturising gloss formula that gives a stunning sheen to leave skin glowing and radiant. With this innovative and indulgent collection, tan-tastophes are a thing of the past! With paraben and sulfate-free formulations, Skinny Tan is suitable for vegans with some Skinny Tan products even being made from as much as 99% naturally derived ingredients! With an array of self-tan products, including Express Mousse, Gradual Tanner, Tan and Tone Oil, Salon Effects Spray and 7-day Tanner, Skinny Tan have a formulation for every tanning need. So if you're after an instantly bronzing tan that lasts up to 7 days, a sweet-scented sensation and a streak-free, natural-looking glow, Skinny Tan's the tan for you. The perfect tanner for those who are at the start of their self-tanning journey, a gradual tanning formula features lower levels of self tan so you can gradually layer up each day. Skinny Tan's Gradual Tanner is formulated with 99% naturally derived ingredients,making it perfect for those looking to tan without nasties. A white body butter cream, it is free from parabens and sulfates and leaves a 100% streak-free finish. Their moisturising whipped coconut mousse formula is also ideal for those after a subtle glow, with a 95% natural formula that allows you to gradually build your tan to your desired level. So, which will you go for? After an instant tan that will wash off when you're done? Skinny Tan's Instant Tanner's the one for you. Suitable for face and body, Skinny Tan's Instant Tanner will give you an instant glow that can be washed away when you're done. With no active tanners, no lasting colour will remain, so the product should be used like makeup. Available in original, dark and shimmer formulations, there's an Instant Tanner to suit every skin type and occasion in this innovative instant collection. From prep and maintainence to instant, gradual and express formulations, Skinny Tan have your every tanning need covered. Created by real women, for real women, Skinny Tan's creators have designed a range that can be enjoyed by every shape, size and skin type. With no-nasty formulations and innovative application tools, you can rest-assured you'll be left with a gorgeous, glowing, natural-looking and lost-lasting tan when you prep, tan and maintain with Skinny Tan. A true home-grown tanning brand, Skinny Tan's created by real women, for real women. Creating a tanning wardrobe that caters to the needs of all women, the Skinny Tan journey began on Dragons Den UK with brand founders Kate and Louise's record breaking pitch. After years of feeling disappointed in the orange finish of tans on the market and the off-putting fake tan scent, Louise decided to create her own formula. Skinny Tan was born out of a desire for a fake tan that was indistinguishable from the real deal. Both in shade and formulation, the product had to be fool-proof and streak-free with no orange in sight. Which Tan is Right For You? The self tan wardrobe's never been bigger, or better, but which formula's the right one for you? With 3 different types of Skinny Tan Mousse, find out which one suits you best! 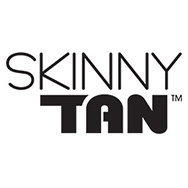 Created by women, for women, Skinny Tan is a home-grown brand driven by the desire to create a range of tanning products to be enjoyed by women of every shape, size and skin type. Seen on Dragons Den UK, brand creators Kate and Louise delivered a record-breaking pitch based on their desired for a non-orange tan that didn't have that horrid 'fake tan smell'. Formulating a tan that was fool-proof, streak-free and natural-looking, Skinny Tan was born. Wanting to do away with the harsh chemicals often found in tanning formulations, the brand creators also decided on a 'skinny' ingredient list, with more naturally derived ingredients. With paraben and sulfate-free formulations, Skinny Tan is suitable for vegans with some Skinny Tan products even being made from as much as 99% naturally derived ingredients! So if you're after an instantly bronzing tan that lasts up to 7 days, a sweet-scented sensation and a streak-free, natural-looking glow, Skinny Tan's the tan for you. Happy taning!